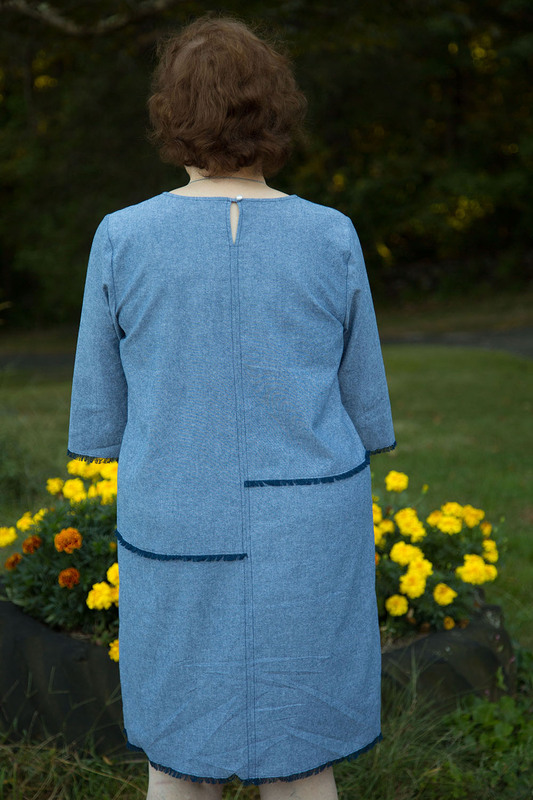 This post is mostly to document some recent projects I’ve made using my much-beloved Burda 09/2006 #114 wrap dress pattern. I now have a total of eight in my wardrobe! Since this dress requires a minimum of three yards of 60″ fabric I’ve also freed up some stash storage space. Previous versions: gray silk jersey, complete with shoulder epaulettes and pocket flaps and black silk jersey floral print. I found that construction went faster and I seemed less tired after they were done when I went about things like an assembly line vs completing one dress at a time start to finish. I cut out the dresses over the span of two days (cutting takes about 30 minutes per dress). Then I spent another day doing the fusing and serger work, which takes around 20-30 minutes and consistes of finishing the edge of the neck facings and sewing/pressing the long edges of the tie belt pieces. I then focused on sewing the rest of the dress (around two hours and 15 minutes per dress), excluding hemming. I then set up my coverstitch machine and hemmed all the sleeves and skirt hems over the span of the next few days. Between pressing up the hems and actually sewing them on the coverstitch machine takes around 15 minutes. This eggplant dress was made from a silk jersey from Gorgeous Fabrics. I bought it four years ago! Wide width silk jerseys that are both reasonably priced and in colors I like can be difficult to find, so when I come across one I like I buy it and stash it. 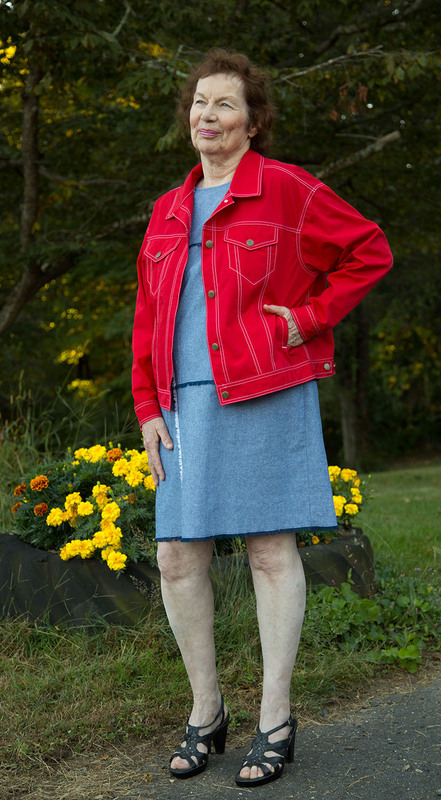 This red dress was made from a crimson ITY knit from Gorgeous Fabrics. Ann’s description of it being a “rich deep color that will look great against so many skin tones” is so accurate! I dislike buying red fabrics online because so many of them have overly warm or orange undertones, which look hideous against my cool toned complexion. This one is one of the most neutral red fabrics I’ve come across. As you might have noticed in the photo I like to wear it with lots of gold toned jewelry. The black dress is also an ITY from Gorgeous Fabrics. I am not the biggest fan in the world of polyester, but I wanted to add some dresses in my wardrobe that I could just throw into the washing machine and put on in the morning without having to worry about pressing. 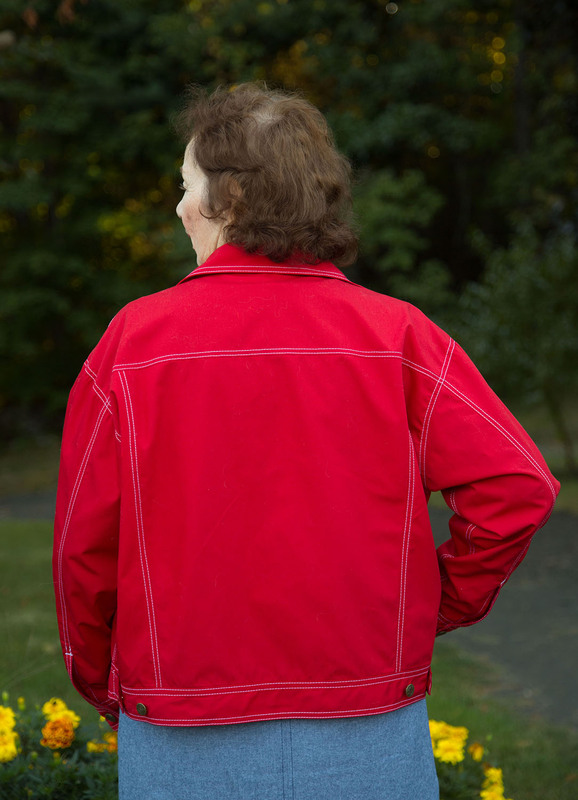 This ITY knits have the advantage of being more durable, resistant to shrinkage, and colorfast than silk jersey. I’m really impressed with them – they have a nice, heavy drape and don’t seem to be as bad with static cling as other ITYs I’ve come across. Highly recommend! 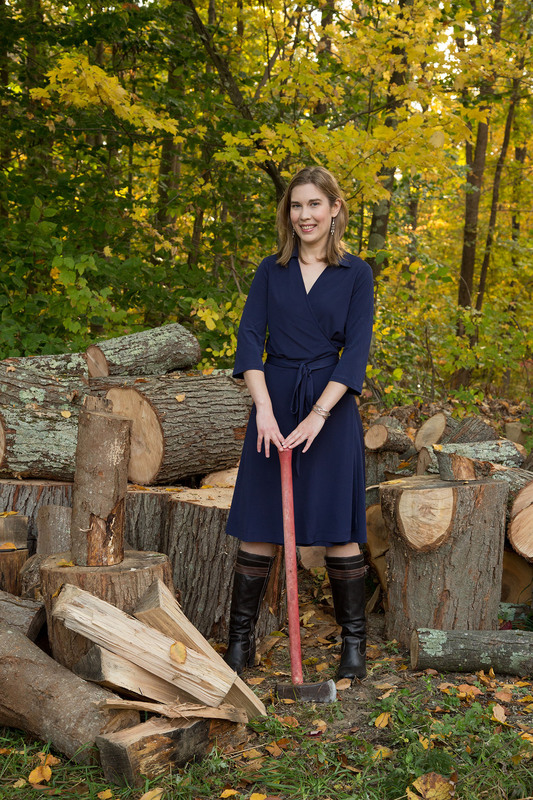 This navy dress was made from a matte viscose jersey, also from Gorgeous Fabrics. This black dress was made from a wool sweater knit I purchased from Fabric Mart’s “Julie’s Picks” swatch club more than four years ago. For this one I included the front pocket flaps and shoulder epaulettes. I also made the sleeves full length. 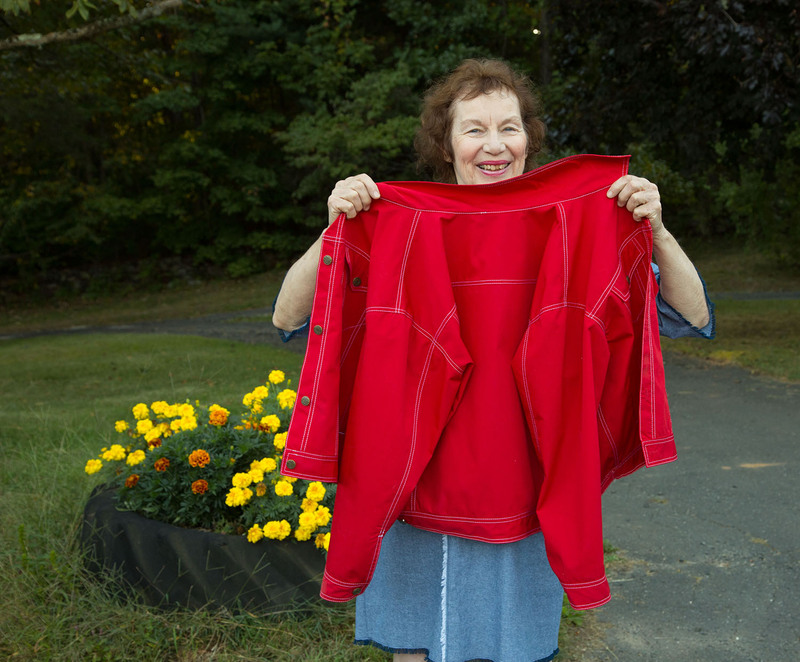 It is a medium weight sweater knit. I would describe the weight as being comparable to a thick cotton interlock. I made this dress sometime last winter but just got around to photographing it now. I’m mostly including it in this post so you can see how the dress looks when made up in a fabric like this. Unfortunately it is too warm to wear to work (my current office is 72—77°F most days during the winter). In addition to the drape being rather meh (which I anticipated) the fabric also attracts pet hair like a magnet! Always good to have a warm semi-casual dress at hand though, so I’m going to keep it just in case. 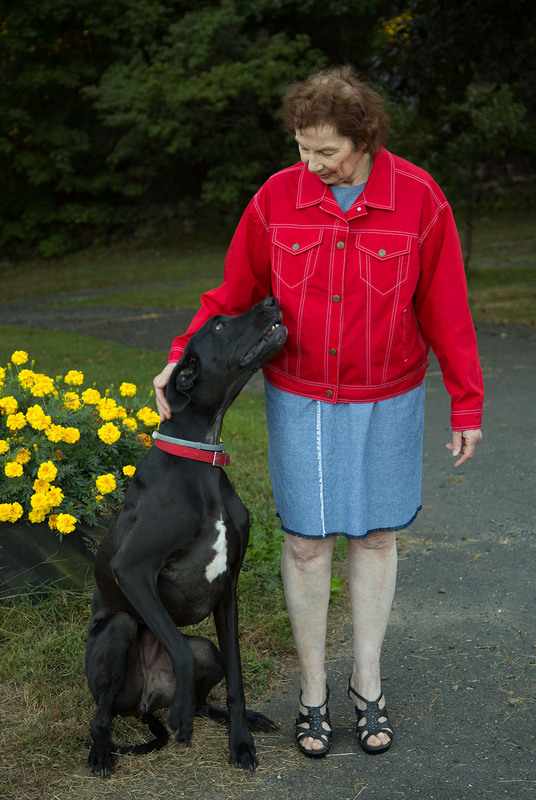 She is Sallie’s favorite person in the world. Neither the Style Arc Stevie (note: affiliate link) nor the Style Arc Jema (note: affiliate link) are something I would make for myself, as I usually go for sleek, tailored, and somewhat formal. (That’s why I’ve been sewing more Burda and Marfy patterns lately.) In addition to sewing something I wouldn’t wear myself, it was a novelty cutting out a pattern and just laying it on the fabric without doing a bunch of alterations first! 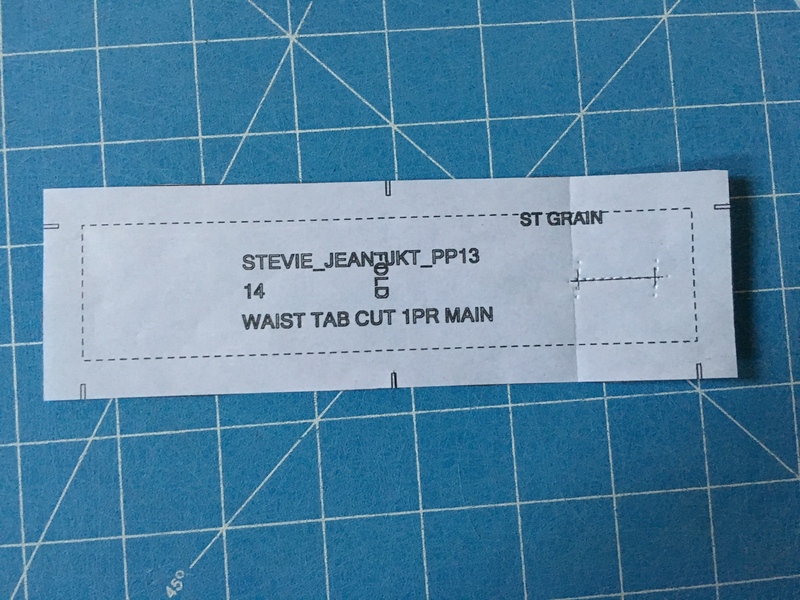 My mom is almost a perfect Style Arc size 14. 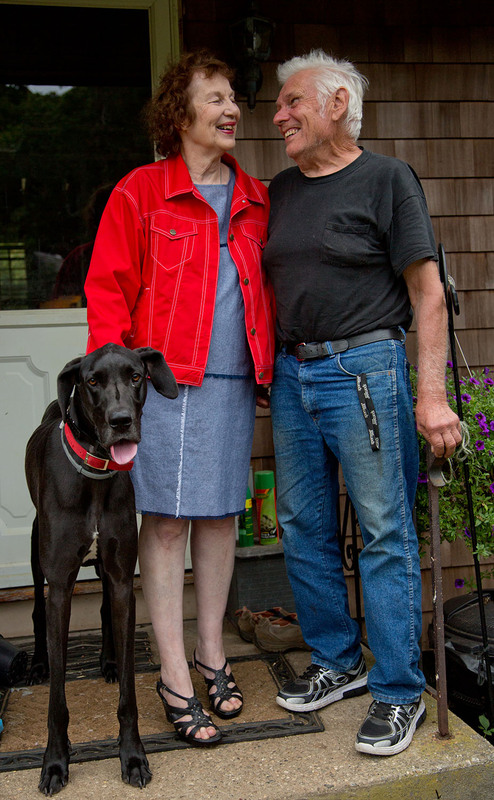 Despite her 5’8″ height I didn’t have to make any changes to the length, which surprised me. There are a couple of fitting issues – I just realized she has a high shoulder and could probably also use a sloped shoulder alteration – but overall I think the fit is pretty good out of the envelope. 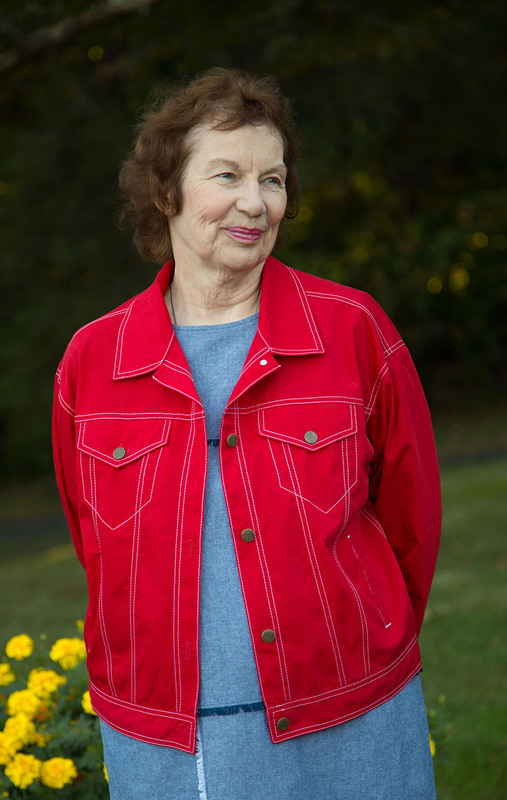 I’m going to start with the Stevie jacket, which is the more complicated garment. There’s almost 20 pieces to this pattern, and tons of topstitching. 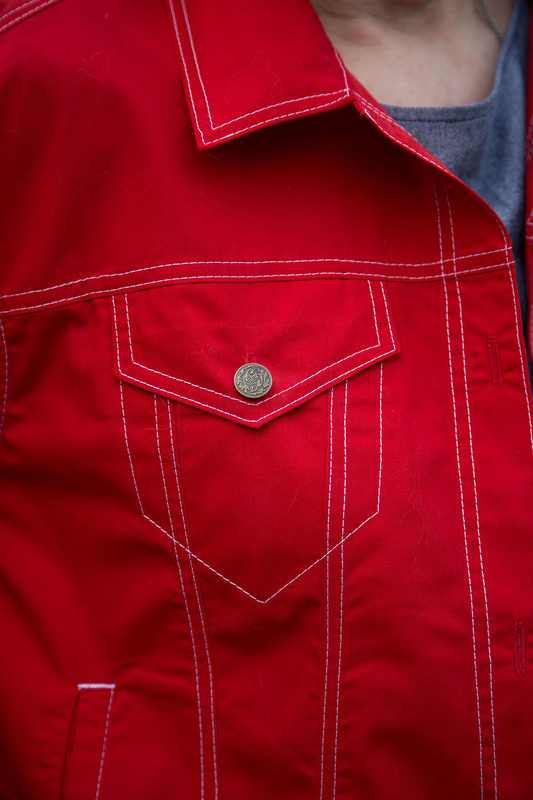 Seriously – every seam on this jacket is topstitched. Even the side seams. 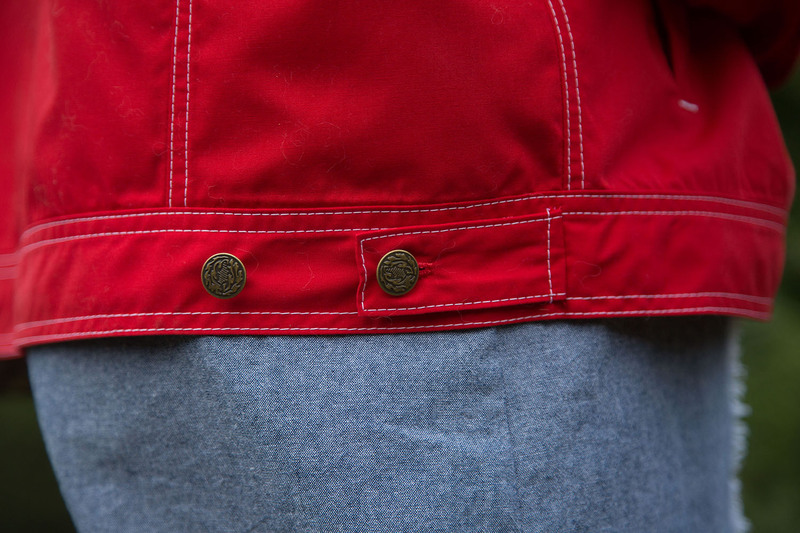 I love the details this jacket has though, and if I made the Style Arc Stacie jacket again I would definitely borrow some of them. As I mentioned in my description the pockets at the bust are fully functional. The tabs on the bottom band are functional as well, though I don’t think most people will move them beyond the first button. 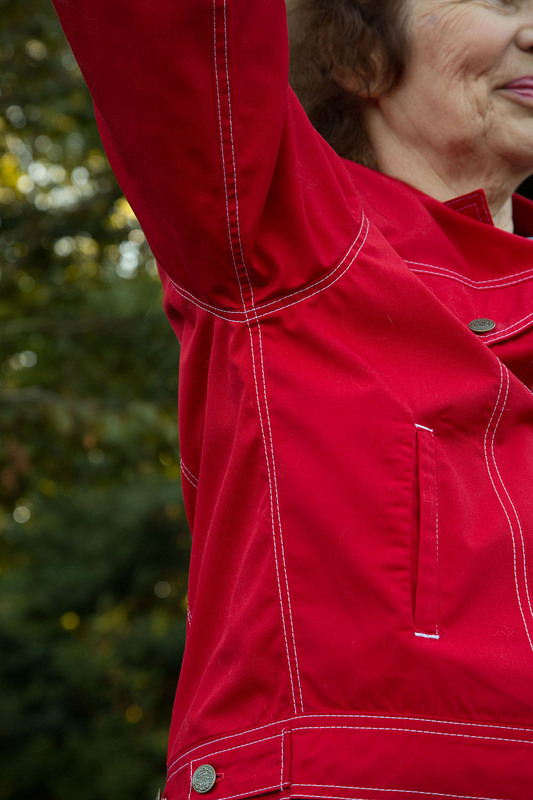 The sleeves have a split so that you can roll up the cuffs. 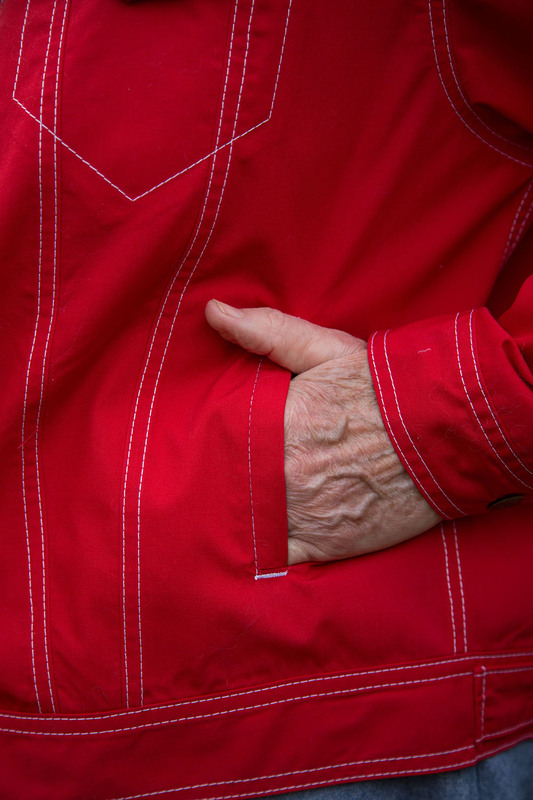 The welt pockets open up to full size pocket bags. The Style Arc Stevie (note: affiliate link) definitely taps into the oversized jean jacket trend, which I’m just starting to see pop up on Net-A-Porter. 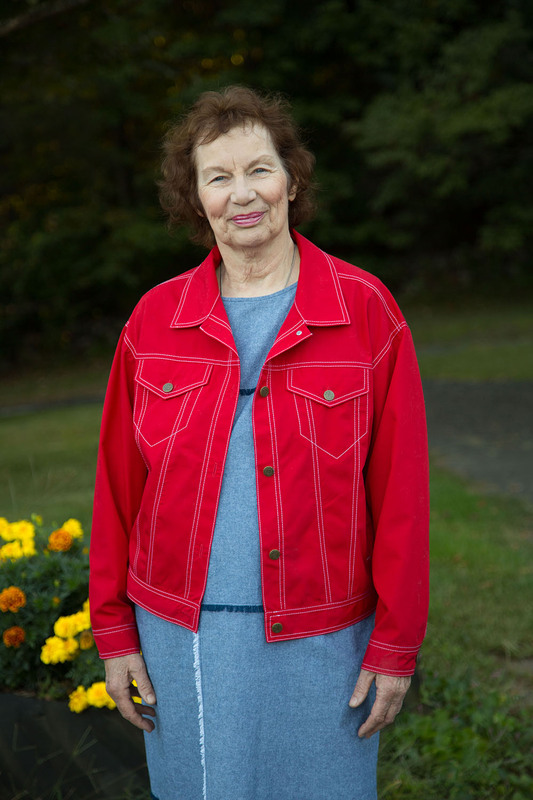 For this jacket I used a bright red cotton poplin from Gorgeous Fabrics. I originally planned on using it for a dress, but in addition to the weight being too heavy for my intended pattern the color was a little too warm for my personal taste. For size 14 I needed almost 3.5 yards of this 45″ fabric. 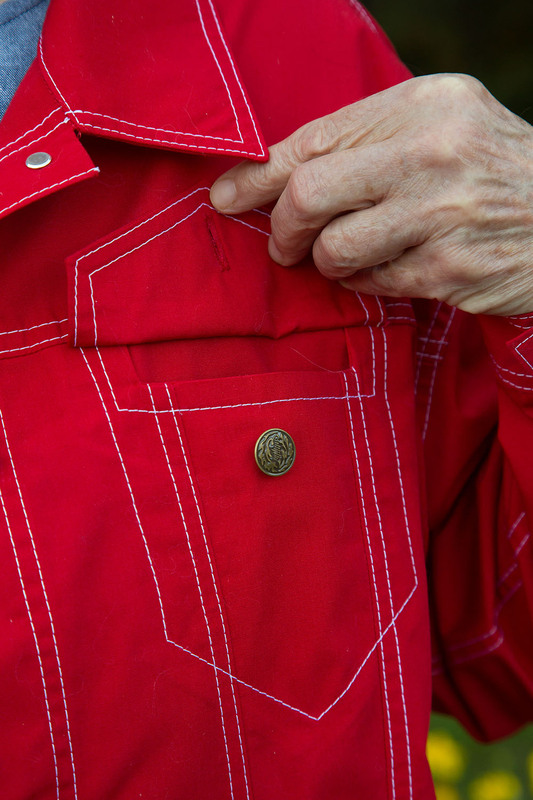 For the buttons I used the oak leaf antique brass jean buttons from Cleaner’s Supply. The topstitching was done with white Gutermann Mara 70 thread, also from Cleaner’s Supply. As I mentioned in my first paragraph, I got away without having to do any alterations to this pattern. The description of being “oversized but not too big” is completely accurate. The welt pockets gave me some trouble. 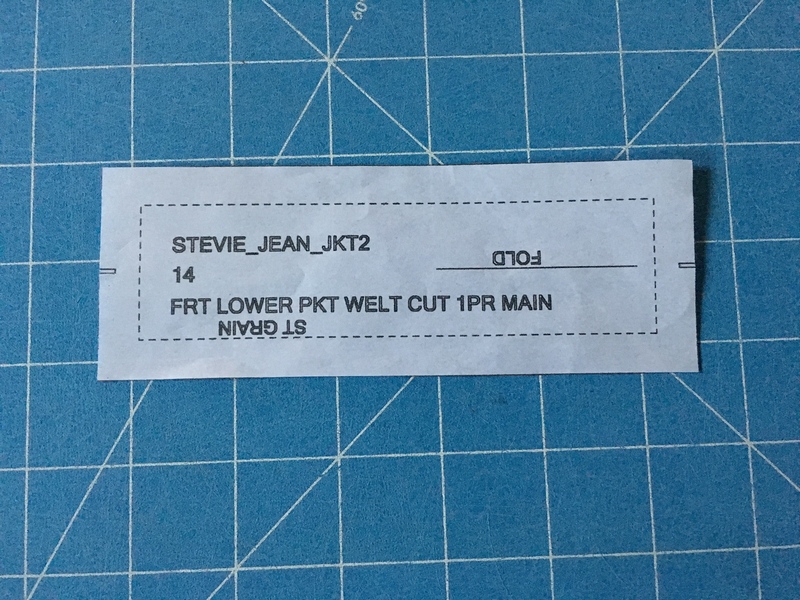 I had never sewn a single welt pocket before (though I was vaguely familiar with the general process) and was thrown off by the fold marking on the pattern piece, along with Style Arc’s instructions to fold the welt in half before sewing it to the jacket. 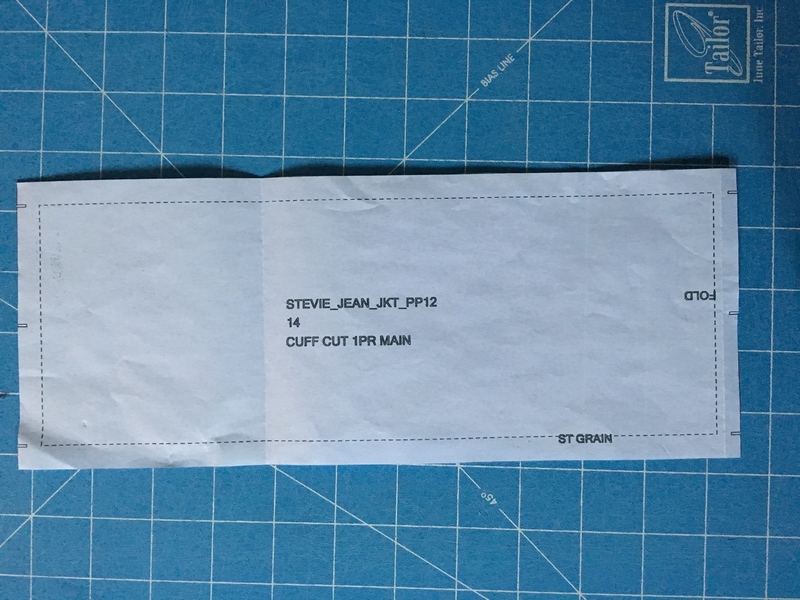 The pattern piece for the cuffs did not include buttonhole markings. Easy enough to manually mark off, but I felt like they should have been included. The neckline is finished with bias binding, which is then turned to the wrong side and topstitched in place. You can do a hook and eye instead of button and loop, but I prefer the look of the button and loop. 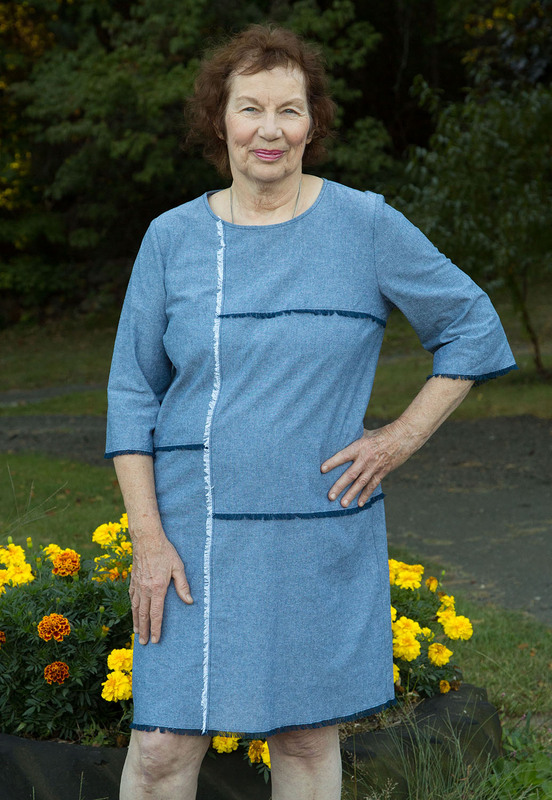 The Style Arc Jema (note: affiliate link) is a loosely fitted woven dress with rectangular panels, slightly flared 3/4 length sleeves, and a back closure consisting of a button and loop. Darts at the bust provide some shaping. I found that while the line drawing does a good job of portraying the fit, it is slightly inaccurate when it comes to depicting the panel proportions. The left middle panel is not as tall and the lower left panel not as short as the line drawing indicates. My mom liked the Jema for the creativity aspect. 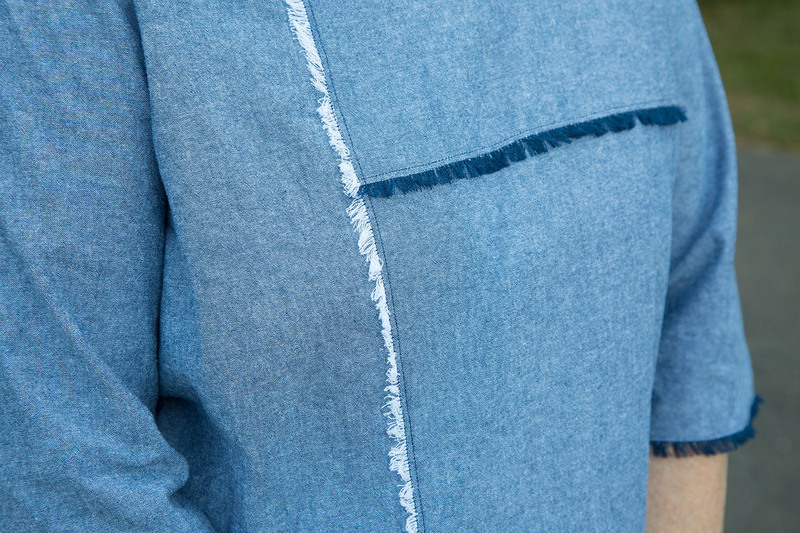 While I chose a rather sedate look consisting of frayed chambray, you can mix and match any kind of lightweight wovens to create a unique look. I believe the inspiration for this dress is this $470 Victoria, Victoria Beckham denim patchwork dress. 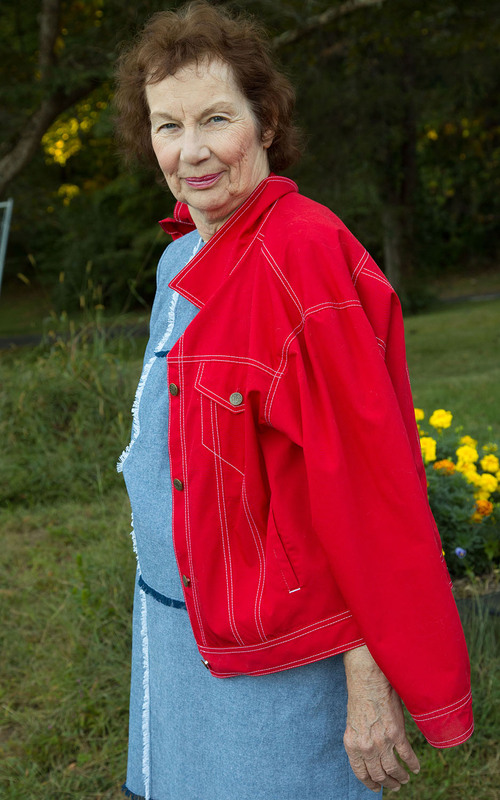 The fabric I used is a lightweight chambray purchased a year ago from Fabric Mart. 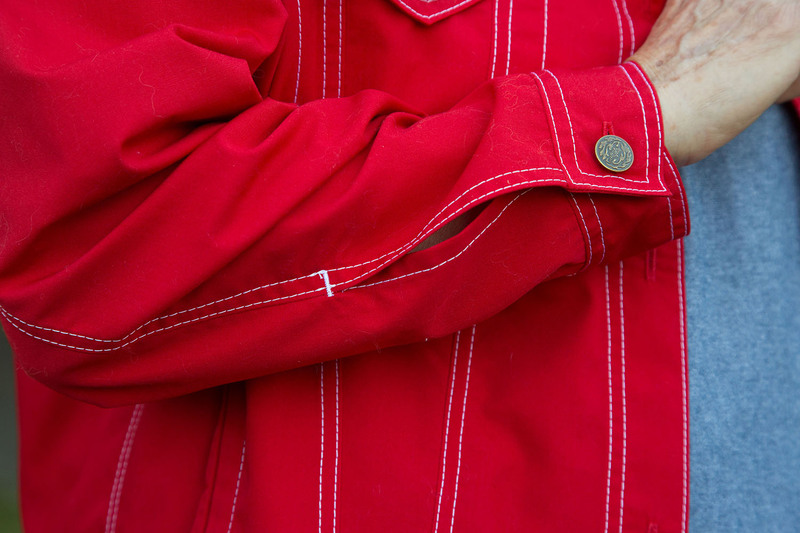 I thought the bright red Stevie jacket needed to be paired with something more neutral. As you can see from my photos the horizontal seams frayed to navy, and the vertical seam frayed to white. Though I didn’t alter the pattern for height, I also ended up not chopping off the skirt hem allowance. When she tried it on she said the ease felt appropriate. It is obviously a loosely fitted dress, but it isn’t overwhelming her with fabric. 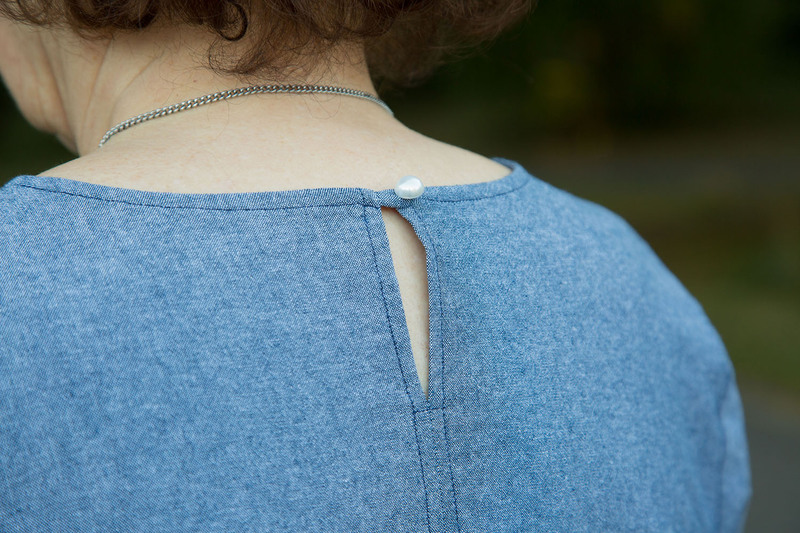 Another thing I should mention is that she was able to get it on and off without having to undo the button at the back of the neckline. As you can see I chose to do the frayed look, which is basically a lapped seam. 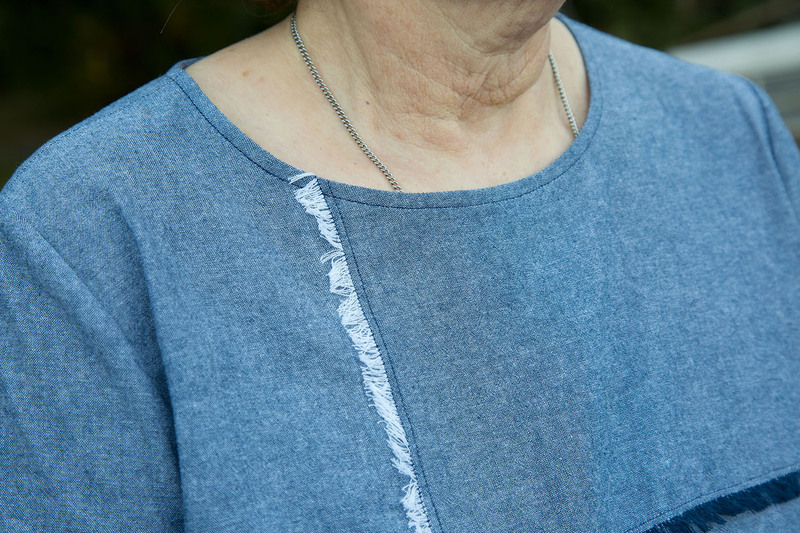 If you choose to do this look you will make your life much easier by using a ruler and the Clover Pen Style Chaco Liner to mark the fabric first. For the panel that will be frayed, chalk in a line 3/8″ away from the raw edge on the right side of the fabric. This is your stitching line. For the panel that will be under the frayed section, mark a line 3/4″ away from the raw edge. This will be where you line up the raw edge of the section that will be frayed. Sew the two panels together, placing the fray panel on top. After I stitched along the marked stitching line (which is 3/8″ away from the raw edge), I did another line of stitching about 1/2″ away from the raw edge. Instead of marking this with chalk I switched to my stitch in the ditch foot, moved my needle all the way to the left, and used the previous stitching line as a guide. After stitching I carefully frayed the fabric. I think this was the most time-consuming part of making the dress. Even so, I was able to cut out the dress and have it completely finished in one night. Burda 04/2016 #122 is a fully lined boat neck sheath dress with a front twist detail. The front bodice is cut on the bias. One thing I liked about this pattern is that in addition to doing the draped design, you could also use the front lining pattern (which has no waist seam) to make a simple sheath. Great for when you want to highlight a print. My fashion fabric was a light blue 4-ply silk crepe I bought from Fabric Mart a few years ago. For the lining I used a silk georgette, which I also bought a few years ago from Fabric Mart. The description describes it as just “georgette” but the weight feels more like a double georgette. During fitting I took in each side seam 5/8″ from the hem to the waist, tapering to nothing at the bust. At the suggestion of my mom I ended up taking up the shoulders 1/2″. The shoulder alteration was definitely not expected, especially since I found the shoulders on Burda 06/2016 #112 a little too short. I think the heft and general shiftiness of the 4-ply silk crepe, combined with the bulk of the front drape and the fact that the front bodice is cut on the bias just dragged everything down. I made it work, but the beefy weight of this fabric was definitely not ideal for this pattern. I would recommend using a charmeuse, crepe de chine, georgette, or any other lightweight silk or rayon instead. Another thing I should note is that the side seams of the skirt don’t hang completely straight. I think the weight of the drape and the bias effect once again came into play, because if I support the twist at the front with my hand, the side seam straightens out. This pattern was obviously balanced for a lighter weight fabric. I stabilized the armholes/neckline/waist with Design Plus fusible stay tape. All stitching was done with Magnifico #40 polyester thread. This thread is thinner and silkier than the all-purpose Gutermann and Mettler threads, and it glides wonderfully through silks. I find regular thread tends to chew up lightweight fabrics. Normally I don’t bother with instructions, but the front drape made me decide to check them out. I found they made sense until it came time to pull through the side front piece to create the twist effect. I’m not sure I did it correctly – the pattern piece indicated a fold, and I did more of a wrap effect rather than a fold in order to gather up those skirt pieces to create the godet effect. It looks like the pattern photo, so I guess I did it correctly!